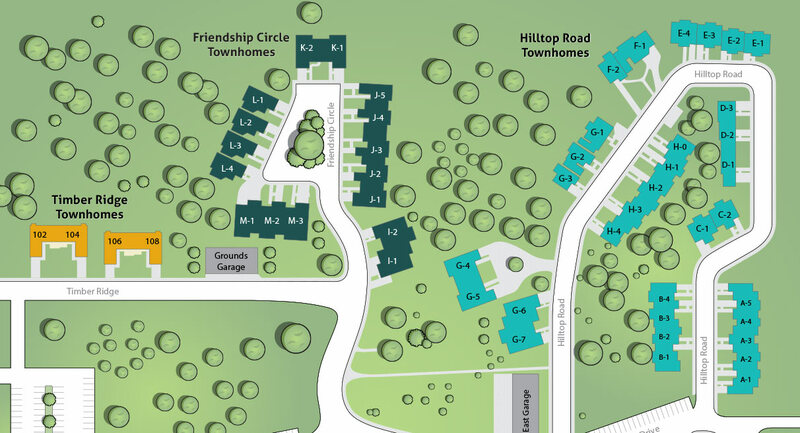 Friendship Circle, Hilltop Road and Timber Ridge Townhomes offer independent, maintenance-free living enhanced with the advantages of being part of our dynamic community. Three distinctive neighborhoods of spacious homes, nestled in stands of magnificent oaks, bring home comfort while offering sights of wild life and birds right outside your door. Our many one, two and three-bedroom plans feature full kitchens, washers and dryers, a utility room, one or two bathrooms, ample storage, and one or two car garages. And we free you from unwelcome indoor and outdoor chores like appliance maintenance, shoveling and lawn work. “I wasn’t interested in moving to ‘the nursing home,'” said Jim. As he toured the townhomes with wife, Ruth, however, he was pleasantly surprised to discover the vibrant retirement community that is Friendship Haven. “This is the best move we ever made,” noted Ruth, who moved to campus with Jim in July of 2011. “We’re very relaxed here. We also enjoy attending the educational programs that are held on campus at Friendship Haven,” she added.